Sawkey Bird and Nature Trail is part of Slough View Park which is located 7 miles East of Saltcoats on Grid Road # 725 and 1/2 mile north of the Castleton United Church which is also located on the quarter section of land known as Slough View Park. One can go on the bird trail by walking to Slough View Park sign at the church or take a tour of the trail beginning at the farm site. The trail is 1.8 km or 1.1 miles in length. It is circular in nature. 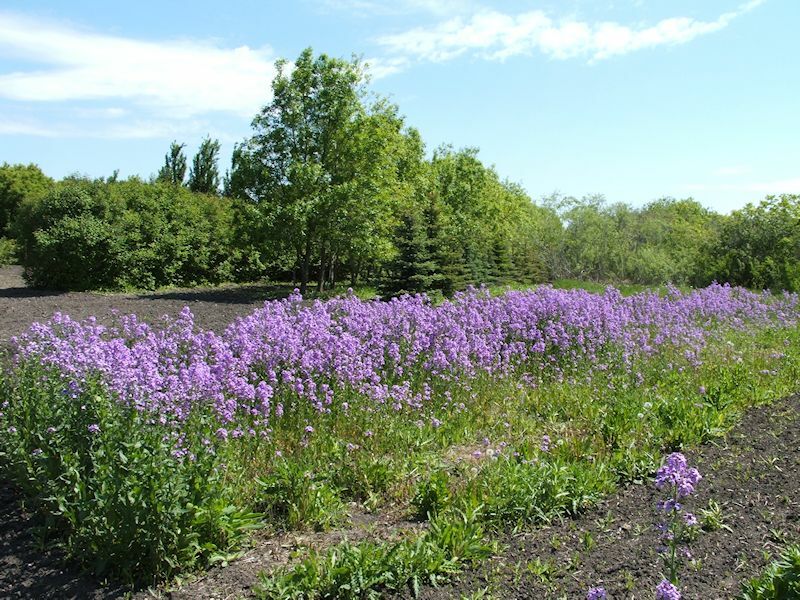 While walking around the trail, one will be able to view sloughs, grass planted for ducks to nest, original growths of trees, shrubs, natural plant growth along with numerous plantations which have been planted to provide birds and wild life with fruit during the summer and fall. If you wish to tour the farm yard during the summer months, you are welcome. We would also be happy to provide you with information with regards to the plantation of trees for shelter and wildlife. Slough View Park is situated just seven miles from the town of Saltcoats, Saskatchewan. The quarter section of land is a wildlife preserve surrounded on the one side by fields of barley and wheat and on the other by sun, wind and sky. At the southeast corner stands Castleton Church built by the area’s original settlers. As fall approaches, the ten-acre yard site abounds in colour – the brilliant yellow of gaillardia, the snowy white of the Shasta daisy, the brazen oranges of the calendula, the battle red of the poppy. Petunias fill in the beds with a myriad of hue – purple, pink, white and red. Roses hold up heads of red and pink fragrant petals. Against a backdrop of evergreens and deciduous trees, beds of flowers stream away to a seeming infinity. Along the nature trail and beyond stand the 20,000 trees John Sawkey and his crew have planted over the past ten years: evergreen seedlings obtained from nearby ditches, poplar cuttings from neighbours, Bill and Ann Tatham, laurel willows from the George Legge farm, and cranberry bushes from Karen and daughter Stacey Onofriechuk. In addition, Sawkey has obtained numerous seedlings from the PFRA nursery at Indian Head. tree plantations during a tour in 2004. Friends have said that Sawkey could grow trees in concrete. In the past ten years, the Park has provided habitat for wildlife: deer, fox, badgers, porcupines, rabbits and squirrels. Butterflies abound particularly when the Villosa lilacs are in sweet-scented bloom. Eagles, wrens, humming birds, orioles, blue jays, hawks, owls, chickadees, juncos, red-breasted grosbeaks, and gold finches colour the leafy backdrop with sound and song. Hidden on the property is the original slough, a paradise for ducks and geese. “Trees and shrubs clean and filter the air we breathe and help fight the greenhouse effect on Earth,” Sawkey stated. Trees provide shade, living space for animals and birds and beauty for the human eye. In 1954 Jean Giono wrote a novel of the same title. In the1980s, Canadian Frederic Back used Giono’s words to create a stunning animated short film, a work that would win him an Oscar. The story tells of Elzeard Bouffier, a taciturn shepherd, who reclaimed the life of an arid region of Provence by planting trees. The area was barren. Beastly winds growled through the belfry of the deserted church. Villages lay in ruin. Bouffier took on the task of planting trees – oaks, beeches, and birches. “He had concluded that this country was dying for lack of trees. He added that, having nothing more important to do, he resolved to remedy the situation.” In the first five years, he planted more than 10,000 trees, a task he completed with no expectation of financial reward. In the end, Bouffier covered acres and acres of Provence with his seedlings. Transformation took place slowly. Meadows, rivulets and flowers reappeared. Gentle breezes replaced the beastly winds of the barren past. Hope, the buttress of the soul, led the inhabitants to rebuild, to plant gardens of vegetables and flowers, to sow fields of barley and rye. Boys and girls learned to laugh. In 1947, according to the Giono story, Elzeard Bouffier died in the little town of Banon, France. He had transformed “a desert into the land of Canaan.” The legend was born. John Sawkey follows in the Bouffier footsteps. He creates a habitat for birds, a preserve for wildlife, a refuge of hope for future generations. Unknowingly, he, too, is a part of the Giono legend. Photo and article by Kathy Morrell. Kathy is a freelance writer who also pens Kathy's Korner on this site.